Another week and a half and Jeremy will be back home. Yeah! We went to clean the office yesterday and Robyn ran in looking for her Dad - was very sad - then she saw his stash of suckers and happiness prevailed again. Jeremy sounds like he is having a really interesting, fun time - mingled with late nights, not enough sleep, and monotony of having alone time in different hotels and on the bus. After two days of high 90s and sunny weather we have had lots of rain/wind storms and cold weather. Whenever the sun comes out our kids run outside to play. Allison taught Robyn how to ride her tricycle a few weeks ago and Robyn will do endless laps. Whenever they can they have been eating their meals outside. We had the cousins over Friday for pizza and movie night and they had a great time running around outside. Even Raiders of the Lost Ark only caught their attention in spurts when they can push dolls in strollers or engage in mock sword fights. Bryn was having a sad night with an ear infection so we stayed up together watching the movie Becoming Jane - I highly recommend it to all Austin fans out there. Gives a whole new spin to Pride and Prejudice. We took Lauri shopping this week as she wanted to try out an adult tricycle. It didn't work out for her but it was really neat. I think I will have to get one someday to bike to and from the library etc. Allison had her last swim lesson this week. She can swim freestyle and backstroke for 15 yards but needs to start working on her strength. Allison and Spencer both have swimming lessons at the public pool in another week. Allison had all her last week of school stuff - a teddy bear picnic - a last day party etc. She had a great week. On the last day of school she went in the morning and Robyn and I went to pick her up. Then we went to get lunch and have our toes painted for a girls day out. Quite fun. Allison was disappointed she didn't get to have the full treatment but I explained that you have to be at least a teenager for that. Spencer has one more week of school. Last week he had art day, music day, airplane day, movie day and field day - what a tough week - not. He is having a great time with all these special days at school. He continues to be into magic and has now officially learned all the tricks for kids on u-tube. Some of them he has gotten really good at - others you have to have a degree of tolerance for. Allison is the worst at the tolerance part - ie "no the card didn't disappear, its in your other hand - you can't trick me, it's not magic" - followed by a grumpy Spencer stomping away. I finished up painting the kid's closets and got their rooms put back together. Spencer was so excited to have a clean room again he has been quite particular about putting everything away - see how long that lasts! But the girls rediscovered all their doll stuff now that they are organized. They both have been pushing strollers around and taking care of their dolls. Robyn is usually doing it while wearing high heels, a stethoscope, a tutu and whatever else she digs up in the dress up box. Sunday is always a tougher day with Jeremy gone but today has been pretty good so far. Perhaps my enforcing quiet time where no one talks to Mom for an hour accounts for my peaceful mood! We even got to church early with everyone ready which is for us a small miracle. Allison did a talk today and after much practice yesterday and during sacrament was able to read the whole thing by herself. She was very proud and did a great job. I got to be in there as I was chorister - what a fun job, who would ever turn that calling down! Taylor had his 12 year old check up this week. He is actually on the charts now with his weight at 2% which is 68 pounds. The doctor commented on how healthy he is for his condition. He had to get 4 shots but now is set until he is an adult. Mostly I just have worked on getting our house to seem clean again - getting closets together, doing laundry, disinfecting the bathrooms etc. Robyn's friend taught her how to "paint" with blue toothpaste this week all over her room and the bathroom. Whoever invented blue sparkly toothpaste was not a parent! Got a few more plants in, visited the library, took kids around - all the usual. I did get two nice breaks this week where I went to a relief society conference on organization/kid activities/easy meals that was really good and I even got to go to the temple yesterday morning. So life is good and everyone is happy about a few more days of school till summer. Jeremy left on Tuesday and is currently in Belfast. We have been able to talk to him a few times via video chat which the kids have loved. He looks a little wiped out with the time change but is adjusting. He is busy with lots of cool experiences and is exploring London and Belfast (so far) when he has the chance. So I am being very thankful that I am not a single Mom all the time and glad I only have 2 1/2 more weeks to go! It is 95 degrees outside right now. Last Monday they finished up our deck - in snow and hail with temperatures in the morning being around 40 degrees but by afternoon reaching 60. Spring in Utah. Our kids are loving the sudden unusual warmth. Allison and Robyn have broken out their swimsuits the last two days and have been busy running through the sprinklers and sucking down otter pops (I forgot the joy of finding otter pop wrappers all over the yard - every kid seems incapable of remembering to throw them away). I have spent the week focusing on pulling weeds, planting our vegetable garden and making a mammoth run to the nursery for the last few plants. 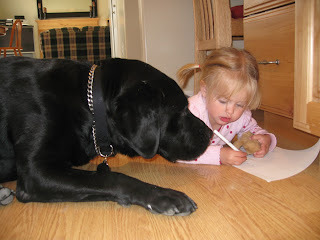 I need to shift my focus this week to our house as things have gotten sorely messy inside. 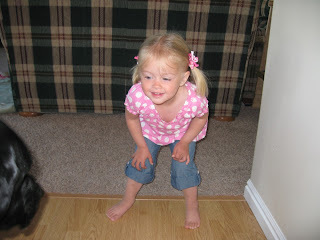 Robyn woke up Thursday with a crusty ear from a popped ear drum. So she is on antibiotics right now. She never had a fever but has definitely had an "edge" lately. This morning I put on some bicycle shorts on her under her dress so she would stop taking her diaper off at church like last week. Tears and wailing for 20 minutes as she tries to take the shorts off. Such a tough life. She is a little busy body and always is trying to find a friend to play with. We babysat three times this week where it was a girl her age and she was in heaven. She asks for Jeremy a couple of times a day and gets giddy when she sees him on the computer. Allison has one week left of school. She had a pizza party Friday to celebrate their kind deeds they have done all year. She thought she was very cool to eat at school and is so excited for next year when she will bring a lunch to school. Two weeks ago Jeremy accidentally left the hamsters out and the next day they were gone. No sign of them since but we have a very happy cat upstairs. Maybe its cruel of us to think of bringing any more hamsters into this house! However Allison is already planning a trip to buy a new one with Jeremy when he gets back. Taylor went fishing this week with his class and he caught a rainbow trout. They go every year where this group of anglers helps every kid. On Monday I met with this years teachers, next year's teacher and the district rep to figure out how it will work for next year. The teacher for next year is getting more confident on how to work Taylor into the classroom and understands that Taylor sitting and "observing" most activities does not work. I think it will work out but I don't think she will be coming up with great ideas on her own. Luckily they have good therapists who will be coming into the classroom. Taylor also got new daffos this week, they are huge! They come in 2 parts and should help prevent him from walking with his knees leaning past his toes. Spencer is having May days at school where it seems like most days he needs to bring something to school (and is starting to do better at asking me a day or two ahead of time instead of the morning of!). He had a Hawiian laua this week (his contribution was Hawiian punch - which he was very proud of going in and buying at the store by himself), he has had a magic day, a joke day etc. We went to the library this week and Spencer checked out a bunch of magic tricks and has been watching how to videos online. So he is constantly asking me or Allison to be his dupe in the trick. A painfully long process sometimes as he tries to remember all the steps or his hands don't cooperate. Spencer also lost a tooth this week - the tooth fairy even remembered at midnight to slip a silver dollar under his pillow. Yesterday we had to go shoe shopping. Taylor needed new shoes for his daffos (he is in the mens section now - a very painful price jump). 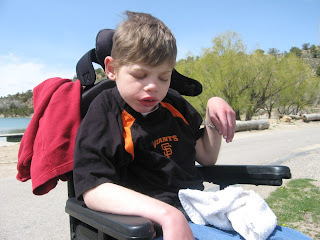 All the kids needed sandals and Spencer needed tennis shoes where his toe didn't stick through the tip of the shoe. Kids did pretty good at the first store but Spencer was convinced he needed to go to the mall as that is where he got his first shoes with Jeremy. So I gritted my teeth in anticipation and we went. Spencer does really good most of the time now. But Mervyn somehow looked different than what he remembered and had planned for and he just lost it. Tears, anger, grabbed a pair of shoes but didn't want to try them on. 30 minutes later we were sitting at Taco Bell for lunch before going home and he apologized. Most of the time his anger outbursts are like hiccups, rare and infrequent and go away fast and not too bad. I forget easily how some things he just can't handle very well. At school there is a group of 3-4 kids who think its funny to try to make Spencer mad. He hasn't physically hurt anyone for a while but he will call them jerk etc and really struggle not to loose it. So his teacher suggested anytime he needs to go sit on the bench in the school and read a book if the kids are bugging him he can. So that is what he is doing. For Mother's Day Jeremy gave me gift certificates for massage apprentices. Last night I went and indulged and it was great. Afterwards I laid on the grass eating a piece of cheesecake from Kneaders next door and reading a magazine. Pure slice of heaven in my week. I am trying to do better about not lifting Taylor as I am starting to feel it more. He can walk and get into things. It just takes more work. Happy Mother's Day Mom and all the other mom's out there. Yesterday Jeremy and I got to have a special outing in the morning and go to the temple and then out for french toast at Kneader's. They have the best french toast, covered in real syrup and strawberries and cream - and free yesterday to all mom's, even better! This morning I got breakfast in bread and opened all the presents kids made for me. I am so grateful for teachers who take the time to make all these cute things because the kids are so proud to see their efforts turn out so great. Spencer made me a notepad and pen and Allison made me a special plate she colored on. They have been asking all week when can I open their presents. Tonight we are having Jeremy's family over to honor his Mom and enjoy a Costco dinner (I don't cook on Mother's Day). This week our house didn't seem quite like a construction zone but still seemed busy. Our kids and dog were getting cabin fever because they couldn't play in the backyard during the day as they worked on our deck. It is almost done, they just need to finish up the stair rail and the trellis. Our finish guys finished up everything they could do before cabinets were installed and a guy in our ward started working on putting up tile for us in the basement shower. Its slowly coming together. I am really excited to get our food storage room done but everyone is thrilled about the deck. Our kids keep asking if they can eat out there every night for dinner now. I'll have to set up a little table out there! It seems like all this work is getting done at once but we have talked and planned it out for so long it doesn't feel as sudden as it does to all our neighbors whose driveways who are getting blocked by construction worker trucks. Taylor turned 12 this Friday. We found the biggest balloon I have ever seen and tied it to the back of his wheelchair for school. His class gave him some more balloons as well to tie to his wheelchair so everyone knew that it was his birthday. They eat lunch in the cafeteria with all the other kids and all of them came up to wish him a happy birthday. Between all the slaps on the back and hugs and doughnuts he brought to share with his class Taylor was chirping happily away all day. Allison and Moms and Muffin day at her school so I got to go with her to class for the first hour. We made Christina's chocolate muffins (muffins is the wrong term for those things, cupcakes is what they should be called!) to share with everyone and did a bunch of crafts together. After school we picked up Jeremy and Lauri to go to Spencer's piano recital. He did so good, got himself ready and calmly there. Said he didn't want to play through his songs one more time at home as if he thought about it too much he would mess up. He did a great job on his songs and didn't freak out when the program was changed due to missing kids and he was 2nd instead of 4th. 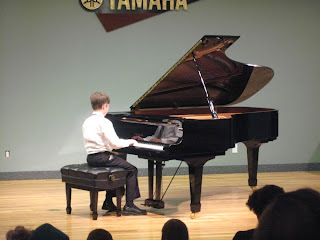 Such a big difference than his recital last year. Robyn decided to be an all out pill of noise and energy from the get go so I snuck in to hear Spencer's song but spent the rest of the recital in the hallway. After the recital we all went out to dinner at Costa Vida - one of those fresh-mex type places we love. Spencer and Allison were thrilled to learn that nachos were on the menu and each downed a plate. Robyn would eat anything dipped in chili con queso. Taylor just kept opening his mouth for more. When we were all done, the place looked like a hurricane had swept through but our kids were happy! We decided we need to do that more often as they went on to clean the office with smiles on their faces the whole time. Saturday night we had Taylor's annual birthday BBQ. We had 7 families come over and 3 more drop by at the end to eat a bunch of food and birthday cake. We usually do it more at the end of the month for better weather but since Jeremy leaves Tuesday we moved it up. 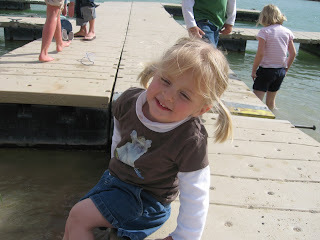 It turned out to be wonderful weather and kids had a great time running around while adults visited. I had my camera with me but forgot to take any pictures! We had everyone bring a side dish and I found a recipe for sloppy joe mix for 50. It turned out pretty good and was easier than trying to BBQ enough for 50 people. With the BBQ, I spent the week trying to fix up the yard. I have filled our garbage can with weeds many times now but there is still more to go. I went and got 2 more trees, a amur maple and another hawthorne which I think will be the last trees we will ever put in! A bit sad in a way. My friends have been asking me what will I do when I don't have to plant anything anymore but I am sure just weeding and keeping up will more than keep me busy. I started the shopaholic book series that Mimi told me about once, they are quite frivolous fun and have kept me reading much too late into the night. Jeremy is busy getting the last of his camera gear together and all of the last minute honey do's that I have - getting the kayaks up on the garage ceiling, planting trees, fixing all the broken sprinklers etc. He is excited to leave Tuesday although 3 weeks is starting to hit with the reality of it. He has gone down to film the Osmond rehearsals leading up to the tour and getting everyone more comfortable with his presence. Spencer is enjoying May Days at school. They have all their state testing but its interrupted by the 3rd grade talent show, bubble gum day, cinco de maya day where they made pinatas and so forth. Allison only has 2 weeks left at school and I swear its becoming a non-stop party in her class. Robyn wants to always be outside and is either very cute or a wiggly screeching bundle of will-power. Taylor is enjoying the warmer weather and is consistently more happy. 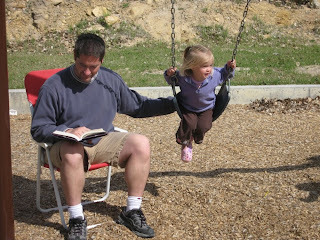 Jeremy's Note: In my defense, Robyn wanted to swing for a long time. I am having trouble loading pictures tonight, so maybe later I'll add some. We just got back from a weekend of camping with 2 other families, the Skaggs and the Blacks who both have trailers down at Palisades State Park. We went there last year with the Skaggs and had a great time that we wanted to start a tradition of going. It is a beautiful area surrounding a man made lake. There is a mile long path that goes around the lake that we walked several times - saw snakes, deer, lizards and fish. There is a golf course there too but this year Jeremy opted for a much needed nap Saturday afternoon instead. We took Rocky with us and he had a great time and did really well sleeping in the trailer at night. He would sit and whine when he would see kids playing on the beach without him as we tried to keep him either on a long chain attached to the trailer or on a leash. We rented a paddleboat Saturday and a canoe Sunday. 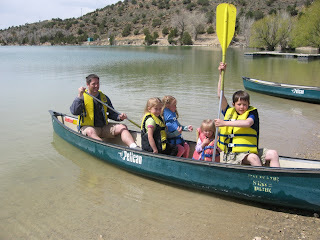 I forgot how much work a paddleboat is especially as my boat was me and a bunch of kids! Kids did really great on the trip except for having to pin Robyn at night while she screamed herself to sleep. Everyone came home sunburned (despite it staying in the 60s Sat) and tired - Spencer went to bed for a 2 hour nap as soon as we pulled up! 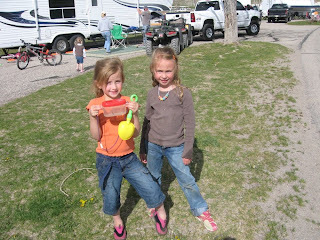 The girls all tried to catch tadpoles all weekend and only had luck by having some other kids share their bounty - they were fast little things this year. Spencer played football a bunch and tried to see how far he could skim a rock. 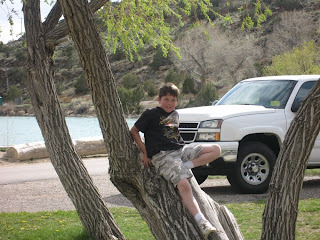 His favorite part was going on a quad ride with his Dad and Bruce to the top of a mountain. Robyn mooched on anyone who had treats, an open lap or was willing to push her on the swings or dig in the sand. Our friends the Skaggs brought their dog Sophie who looks like Dad's old dog Goldie - she loved her and followed her everywhere. I forgot how much work it is gearing up for a camping trip - especially the first of the season. Just making sure we had everything, cleaning the trailer, cooking the food, packing everything we might need etc. We cleaned the office Thursday night so we wouldn't have to worry about it this weekend. It was sure nice to get away from any responsibilities though. You still have kids to take care of and entertain but no house/yard/church jobs calling your name. This last week our house felt a bit like a construction zone. Our finish guys worked all week on the basement and added some shelving upstairs while they were at it. It made for a noisy house. Then we started our deck on Wednesday. Its great to have everything coming together but makes for a chaotic household. At the moment all the stuff from the office and the girls room is in our bedroom making going to bed a tricky business and forget about any midnight trips to the bathroom unless you want to break a leg! I am hoping to paint their shelving and get stuff back out of our bedroom soon. Answering construction guy questions and stressing that they did a shelf wrong etc has been most of my week. I feel like I need to stay home as much as possible with all these different people going in and out. Rocky got to go to Spencer's school this week for show and tell which Spencer loved. Spencer is really struggling with not eating too much. Several of his pants can barely button. I feel torn between whether the med dosage he is on is worth it. His teacher says he no longer paces the classroom but will sit at all the appropriate times for reading etc. He got up at pack meeting this week all excited to take part in a skit. There are a lot of plusses. But I feel like I am giving him a complex talking about his eating all the time and reminding him to slow down or not eat so much. He gets a lot of negatives thrown at him all day long, its hard to remember the positives.